You can download Shuaa Digest February 2017 ( urdu شعاع ڈائجیسٹ فروری 2017 ) ( also : Shua Digest January 2017 ) free in pdf format. 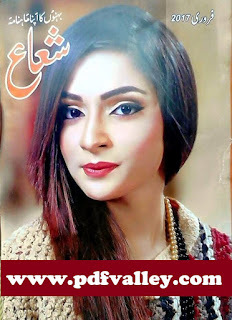 Shuaa Digest is a famous Urdu digest which contains Romantic Novels , Afsaane , Episode wise long novels etc. Famous writers of Urdu novels start writing with the help of Shuaa Digest.It contain high moral stories which can build good character of women. Shuaa digest is famous around the world not only in Pakistan but also in India, USA, UK, Australia, Canada etc.Shuaa digest is most famous in all age of women.